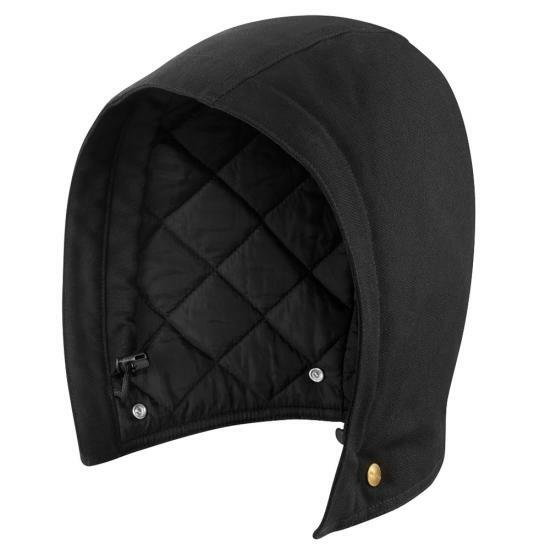 This hood fits most Traditional duck jackets or coats that have snaps under the collar. The midweight lining will keep you warm from early fall and into spring. 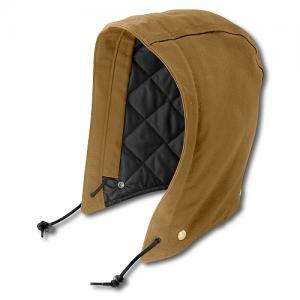 This hood, bought as a companion piece for the matching Carhartt Overalls, completes the set of Carhartt gear that'll keep you warm, dry, and comfortable even in the most inhospitable cold or weather extremes when you're way out back or right in your own backyard. It's large enough to fit over any kind of headgear, including baseball caps, toboggans, and the like. I highly recommend adding it to your purchase if you're buying a set of Carhartt Overalls. You'll be glad you did when the rain's blowing sideways or when the hail, sleet, or snow is making life miserable. This is a well constructed high quality product. This insulated hood is a good high quality product that will keep you warm in cold weather. works great with my jacket and coverall's. Love the fact that you can take it off and put it on when needed!!! One size soesn't quite fit all. I bought the hood to go with my Husbands Carhart coveralls. I am very pleased with the quality of the garment. I have one problem though. My Husband is a big guy, I bought size 60 coveralls. The hood does fit the coveralls but the neck on the hood and coveralls needs to be larger to fit a man with a girth that large. They almost but not quite fit. Quick delivery. Perfect match! Fits right onto my jacket. Taking it pheasant hunting in two weeks - anticipate it will do everything I need it to. Cheers! This hood was big enough that when it was attached it was comfortable. With this hood I was able to shovel snow in near zero temp,with wind chills below zero.